University of the Punjab Quaid-i-Azam > Behavioral and Social Sciences > Institute of Communication Studies > Mr. Naveed Iqbal Ch. Main Page > Quaid-i-Azam > Behavioral and Social Sciences > Institute of Communication Studies > Mr. Naveed Iqbal Ch. 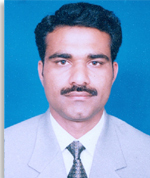 CV of Mr. Naveed Iqbal Ch.